I was just flipping back through the blog and realized I never wrote up anything about my 2002 Honda XR650R. 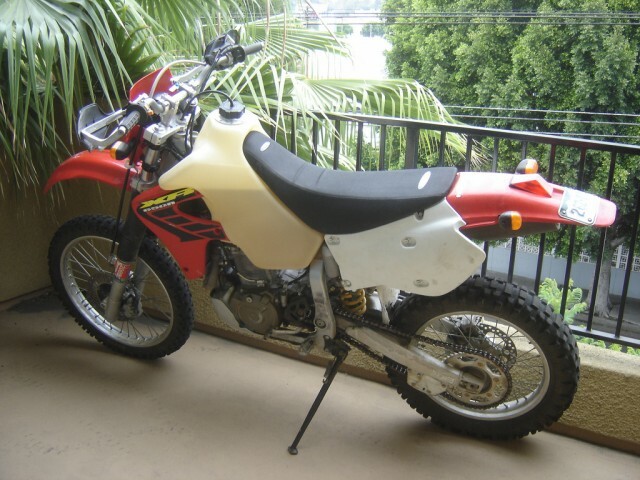 I’ve had a lot of XR600’s and other Honda singles, but I always wanted to have a go with an XR650R. The aircooled XR600R was retired after it’s final production year of 2000, the same year the XR650R was introduced. It was a long time coming as the XR600 was certainly behind the times in terms of technology, both performance and manufacturing. Honda’s Baja race team was still using the 600 through 1999 and it just didn’t have the mechanical advantage it used to. The outdated 600 was performing well in the races during the mid and late nineties only because Kawasaki had pulled it’s support from Baja and was no longer racing the KX500, which trounced the XR600’s earlier in the decade. In any case, the 600’s were no longer competitive desert racers compared with the competition and they were log overdue for an update. The resulting bike is a thing of beauty. The power output of this bike is incredible. It will lug around with the best of them and also hum down the highway all day long. It is a perfect mix of general off-road performance and distance comfort. Over the last ten years the motors have proved to be very stout and robust. Mine ran like a champ all over the southwest. I wrote up a couple reports which are a bit old now: Across the Southwest on a XR650R and The Mojave Desert on a XR650R. I didn’t have to do too much to this bike. When I got it it had the RSW triple clamps and bar risers, which are a good quality product, though in my experience with the owner over there he isn’t the friendliest of guys, so I’m hesitant to recommend them. It also had an SDG seat which is raised about 1.5 inches over stock. I added some Fastway guards, redid some wiring, and put on an oversized IMS tank. That’s about all it needed in my opinion. I’ve become somewhat of an aficionado on the XR650’s (like I try to with all my bikes) and have been working on an online resource specifically for them, here: Honda XR650R. I no longer have this particular bike. It actually got shipped over to Russia and I believe now may be in Japan. I’ll definitely own another in the near future. Yamaha XS850 Triple Bobber ProjectAny restoration shops in Philly who work on Triumph & Matchless? Hello! When i see a Honda bike like yours, it just moves me into more faith that one day i will get just one like that BIG Honda XR650R! My dad has a 2002 xr650r and i want to buy him an e-start for it. Do you happen to know where to get one?